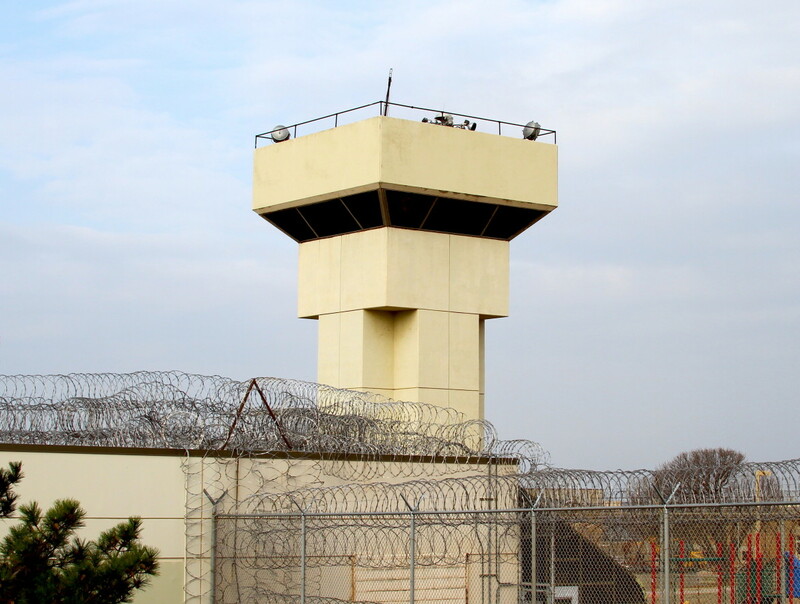 A guard tower at the Joseph Harp Correctional Center in Lexington. Oklahoma's incarceration rates remain high, according to newly released 2014 figures. Despite efforts to reduce incarceration, Oklahoma’s prison population is growing at a steady pace. The trend includes a surge of state inmates being held in county jails in recent months and the rate of women in prison reaching its highest recorded level. Oklahoma Department of Corrections data show that since late 2014, a year when early-release policies were relaxed to help reduce incarceration, the number of inmates in corrections facilities has increased by nearly 1,200, reaching 28,095 near the end of 2015. The total also rose throughout 2014. Data released by the U.S. Bureau of Justice Statistics also show that Oklahoma had the second highest incarceration rate in the nation in 2014, at 700 inmates per 100,000 population. The national rate was 471. Oklahoma ranked fourth in 2012 and second in 2013. In addition, the state also led the nation in rates of imprisonment of female offenders in 2014, the latest year for which national data is available. Oklahoma’s lockup rate for women – 143 per capita in 2014 – was more than twice the national rate and the highest it’s been since the Bureau of Justice Statistics began tracking numbers in 1978. Oklahoma Watch calculations indicate the rate likely increased in 2015, with total women in corrections facilities reaching 3,002. Oklahoma also had the highest rate nationally of prisoners housed in in-state private prison facilities, including halfway houses, according to Bureau of Justice Statistics data for 2014. By last month, the number had increased by about 9 percent, to 8,044. The resurgence of a jail backup intensified in fall of last year. A backup of around 1,700 inmates at the end of 2013 was whittled down to 313 inmates by the end of 2014. However, the backup number has since more than doubled to 795, Corrections Department figures from Dec. 28 show. Much of the increase occurred in October and early November, when counties across the state sent sentencing documents for hundreds of inmates to DOC, officially transferring custody to the state. The sudden jump came after the Corrections Department notified counties that because of a change in state law, which took effect Nov. 1, records for all inmates sentenced before Nov. 1 were required to be delivered to DOC by Nov. 4. Under the new law, counties now face a three-day deadline after sentencing to deliver those records to the Corrections Department. If they are late, DOC will not pay the counties for the inmate’s stay in the jail between the time of sentencing and the time the documents are delivered. The law’s purpose was to reduce the payments the state was paying counties during periods when delivery of the sentencing documents was delayed. Such records are official notice that an offender is headed for a DOC facility. Alex Gerszewski, a spokesman for the department, said the agency must find bed space for the higher number of state inmates being held in jails, but that will take time. “In trying to find more bed space, we have to work with our field operations people, and they work with the fire marshal and the facilities to figure out which rooms we can use (to add bunks) and where we can squeeze more beds,” Gerszewski said. To address the population growth, the department requested $17.4 million from the Legislature for the next fiscal year. Lynn Powell, president of the Oklahoma chapter of the prisoner advocacy group Citizens United for Rehabilitation of Errants, said the state’s growing prison population, coupled with looming budget woes, contribute to a criminal justice system that has become unsustainable. In 2011, the state passed measures collectively known as the Justice Reinvestment Initiative in an effort to lower the state’s incarceration rate. However, much of the initiative was sidelined after conflicts between Gov. Mary Fallin’s office and individuals sitting on the initiative’s implementation committee. In 2014, Fallin’s office worked to revive the Justice Reinvestment Initiative, and in 2015 Fallin pushed the Board of Corrections to consider changing how early-release credits are awarded to inmates serving time for so-called 85 percent crimes, which require offenders to serve 85 percent of their sentences before becoming eligible for parole or early release. Later that year, the board adopted the measure, which allows credits to accrue while the inmate is serving the 85 percent portion of their sentence. In 2014, to address overcrowding, the Corrections Department began putting bunks in prison common areas such as gymnasiums to house the inmates, while also restoring early-release credits to some inmates who had lost them because of misconduct. In October 2015, the Corrections Department increased the number of beds it leases from private prison companies – Corrections Corp. of America and Geo Group. The department has projected an overall increase of 1,200 inmates over the next year. Oklahoma has consistently held the highest rate of female incarceration in the nation since 1998, the data shows, and that rate has increased by more than 16 percent since Oklahoma Watch highlighted the issue in 2011. Oklahoma’s private prison incarceration rate has been the highest in the nation since 2011, the data show, and the state with the second highest rate in 2014 was New Mexico, with a 147 inmates in in-state private prisons per 100,000 population. The state has continued to look for ways to reduce the prison population. In her weekly column issued this week, Gov. Mary Fallin pointed to steps aimed at addressing the large prison population.